There was a lot of speculation about the viability of playing Duskmaw in the traditional Broodqueen build. Some adamantly refused to believe it would work because it would add 6 Nekrium cards to the deck, throwing off the balance for Broodqueen's allied trigger and Bramblewood Tracker's free drops. 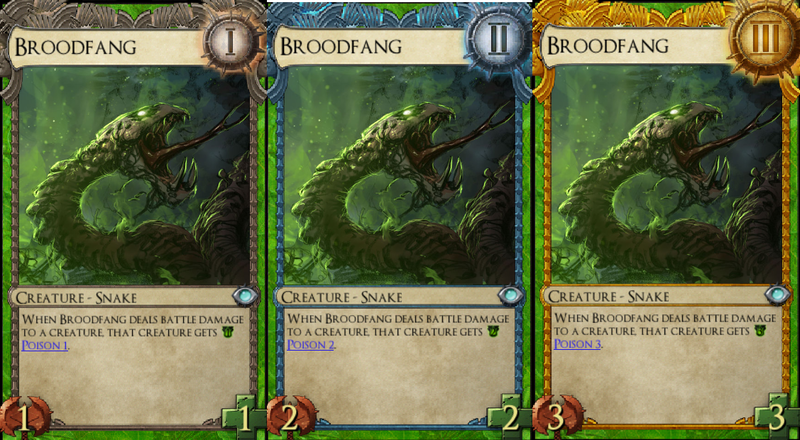 Well it turns out the BroodMaw deck is ridiculously strong. Normally I stay in the casual realm of Solforge, playing decks for fun rather than farming competetive queues all day - but some of you who visit the Ladder may have noticed I've recently been putting up solid numbers. This will be a guide to the deck that lead me undefeated through a ladder tournament, snagging an invitation to the Standard portion of the Kael Cup and skyrocketing me from being unranked on the ladder to a comfortable position in third place. After my success on the ladder I piloted the deck through six queues of this weekend's Forgemaster event, maintaining a win rate in excess of 90% across 24 games. While the decklist can be found at the ladder tournament page I'll go through and in-depth explanation for each card for some of you newer players before explaining the individual match-ups you may face in the queues. 3 Duskmaw, Twilight Drake - The new toy in this particular deck. While most players focus on the unconditional removal it provides through it's Solbind card, it also adds further reach by being the first mobility creature playable in the UN list after the Grimgaunt Doomrider was nerfed. The Tendrils of Twilight that this card adds to your deck can shape combat math in your favor even without the drake to back it up. 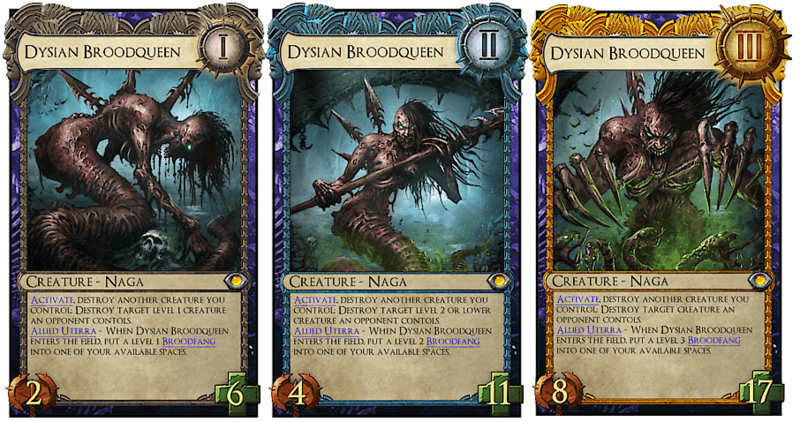 3 Dysian Broodqueen - Half of the namesake for this deck - great for removing on-level threats from the board, and discourages opponents from going all-in on a big creature. This card has been tearing up the metagame since set 3 - don't really need much more explanation for it than that. 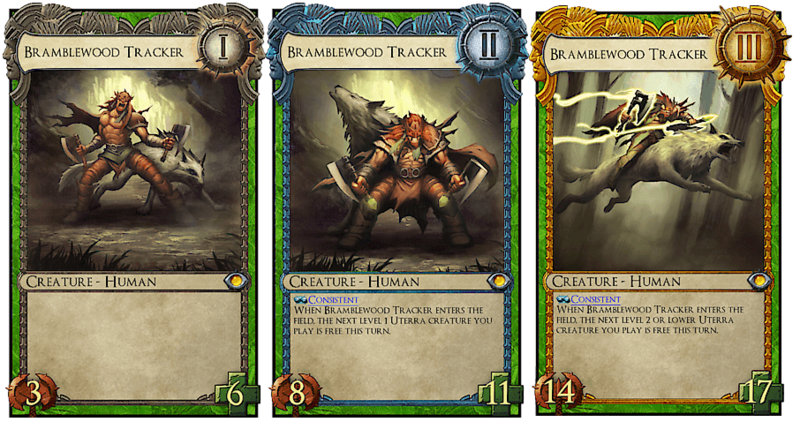 3 Bramblewood Tracker - While it can be a weaker play at rank 1, it gains consistent in an over-sized 33 card deck and generates free value through the extra plays later on. 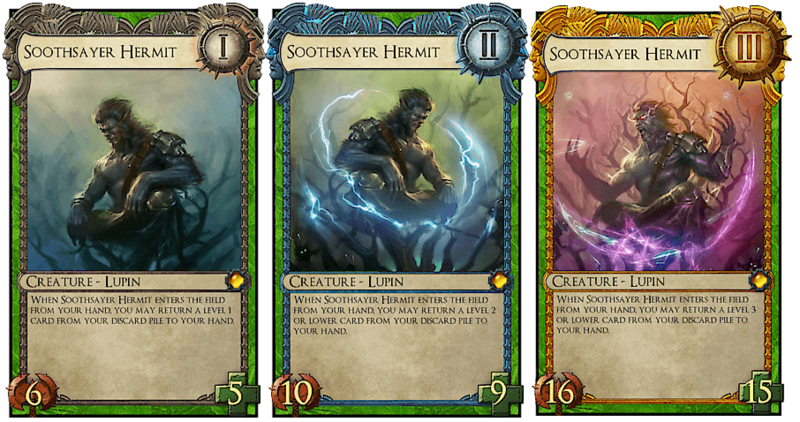 3 Soothsayer Hermit - Have a Tendrils but no Drake, or a Drake but no Tendrils? No problem. This guy will yank back the cards you need when you need them. 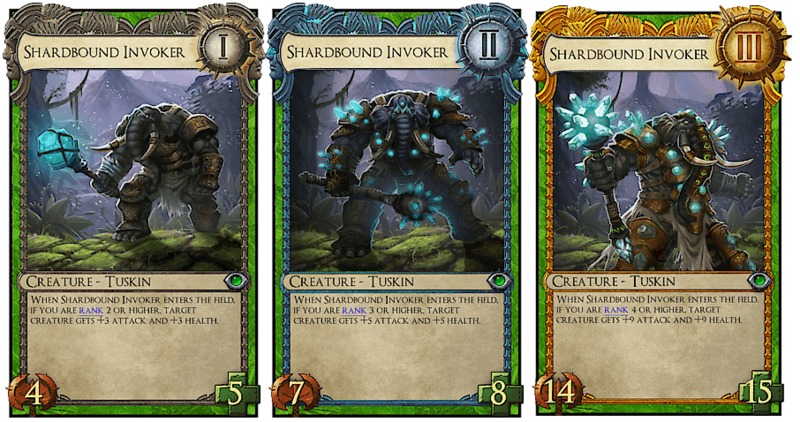 Increases the consistency of the deck by being able to get what you need, even if the 33 card solbind inconsistency makes you see a smaller percentage of your deck per level. 3 Thundersaur - With all of the pump ability this deck has to offer, Thundersaur can turn into an unstoppable force and close out the game early. Even if it doesn't stop your opponent itself the breakthrough will put a dent into their life total for the rest of your cards to clean up. 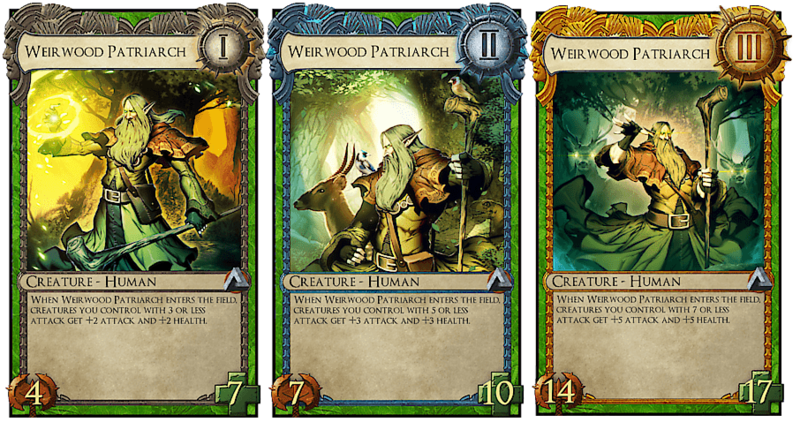 3 Weirwood Patriarch - A solid body by himself, he pumps up your Broodqueens, Broodfangs, Trackers, and Thundersaurs at rank one. When played will often provide at least one, if not two or more, additional upgrades for your team. 3 Shardbound Invoker - Pairs well as a free play with Bramblewood Tracker, working as an underdrop or as a way to bend combat math in your favor. 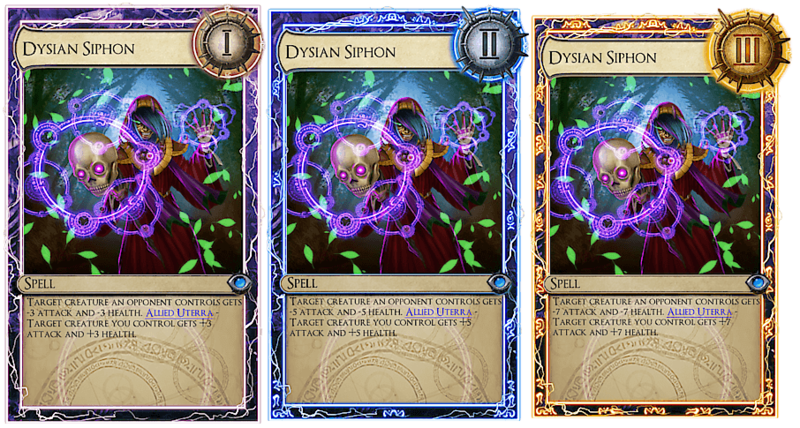 2 Dysian Siphon - Remove already weakened creatures off the board while making your threats bigger - pretty straightforward. 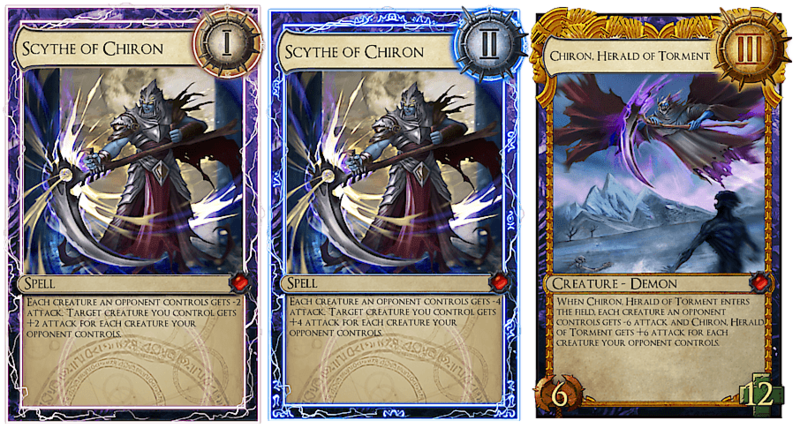 3 Scythe of Chiron - Rarely reaching level 3 this Herald spell does wonders at influencing multiple lanes in your favor. 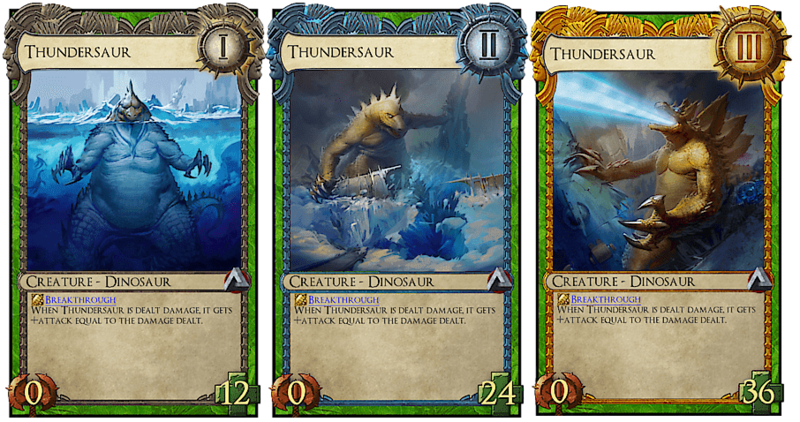 Can push in tons of damage on an unblocked creature, turn multiple trades in your favor, or be used to make your Thundersaurs gigantic. 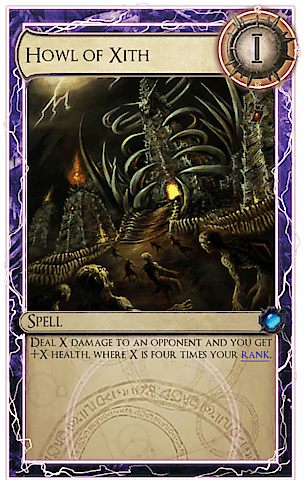 1 Howl of Xith - Extra reach in order to burn out your opponent in the off-chance the game has moved out of your favor once the opponent is low on life. While a 1-of this spell can always be brought back by the Hermit for multiple plays. Insurance that none of your games will run too late. The Mirror - Knowing your opponent is going to be running Broodqueen or Duskmaw it's important to deprioritize the use of Thundersaur because while it takes a while to grow up and can get removed in a quick action. Likewise - Aetherphage works well to interfere with your opponent's ability to cast their tendrils, and works better than it would in other matches. Try to level Broodqueens and Duskmaws to focus your opponent's removal, then use the free plays from leveled Trackers to gain traction on the board with the free value. 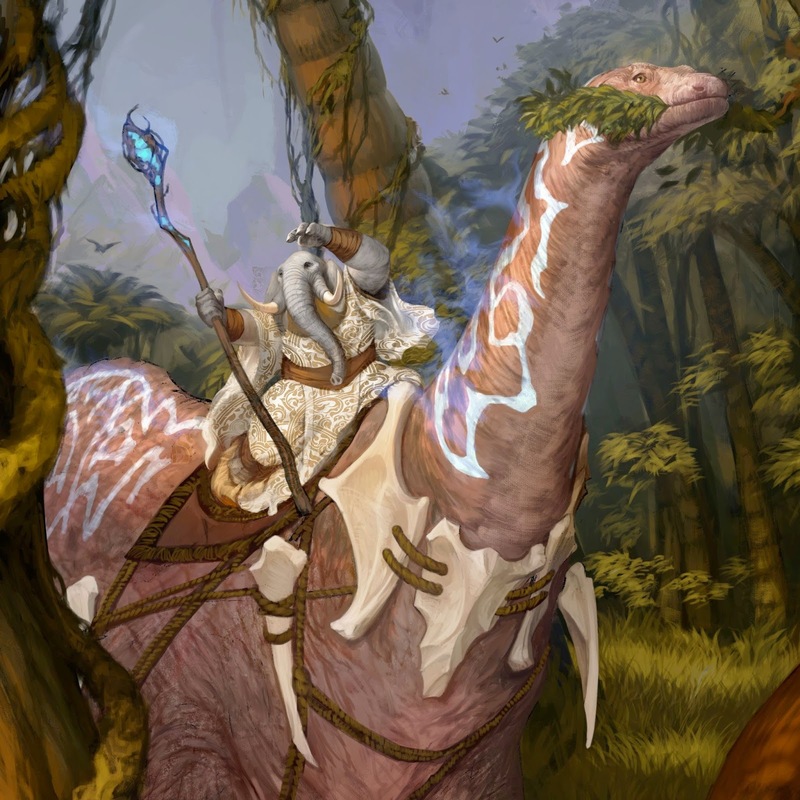 Dinosaurs - There are a number of Dinosaur decks circulating around with the release of Bron, Wild Tamer in set 4.2. While Uterra/Nekrium Dino decks play more similarly to the mirror match in terms of leveling - Uterra/Tempys dinosaur decks lack non-damage based removal. Against most aggressive creature-based strategies Thundersaur is able to shine, growing uncontrollable to the point that it is hard for the limited removal available to the UT deck to handle it. Wegu Lifedrain - While you have to account for the possibility of your opponent using Duskmaw synergy to remove your creatures, you need to level as many of your own Duskmaws and Broodqueens as possible. Wegu is explosive and can easily reach 40+ attack in player level 2. Remove any Crypt Conjurers and Wegus as soon as possible. Because of the large amount of nekrium spells, thundersaur will just be debuffed, prioritize the use of Aetherphage instead to interrupt your opponents spell chains. Alloyin/Tempys - This deck centers around simply using Relic Scout to push high-value tempys cards like Frostmane Dragon and Borean Windweaver. 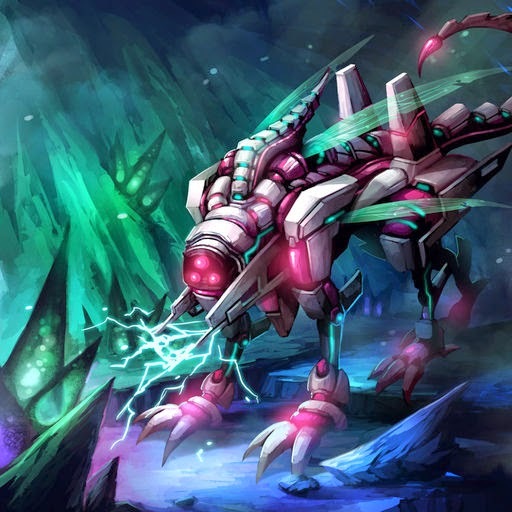 You can expect Battlebrands and Oratek Explosives for solid removal, as well as lots of mobile creatures. Due to the high removal chances Broodqueen becomes less valuable, and the mobility lets their creatures dance around your thundersaurs. 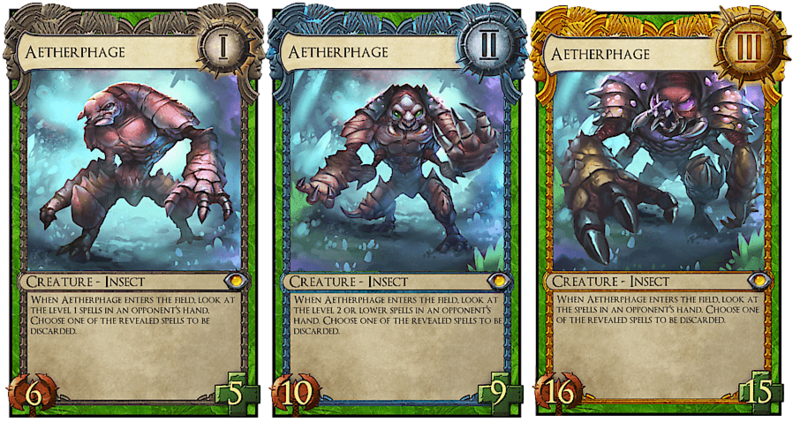 Aetherphage will provide a strong body while cutting down the chance of any removal shenanigans. 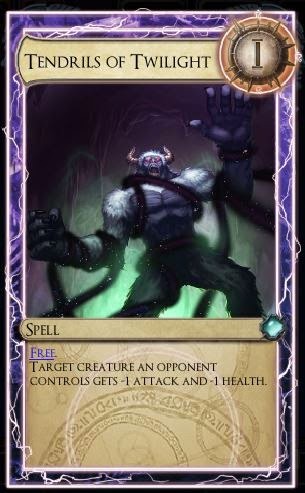 Meanwhile, your own spells work wonders, working to remove the buffs given to your opponent's creatures, and synergizing with Duskmaw to get free kills.